When Rachel was 2 years and 2 months old she was ran over by the left side tires of a mini van. This was on the 28th of February 2013. She cracked her pelvic ring in 4 places and the base of her skull in 3 places. 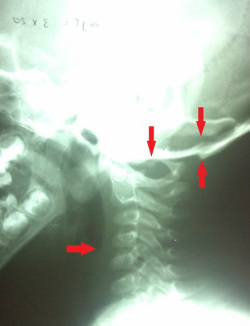 One fracture ran long from ear to ear and two that broke off of that break and went up and down the skull. She was in the hospital for 6 days while she recovered from the injuries incurred that day. She was in SPICA cast for 4 weeks. We started seeing Dr. Blom after the SPICA cast came off. She did not get adjusted till the middle of May even though we started going to Dr. Blom in April because he found a crack in her neck that the hospital had not told us about so we waited until that was totally healed. We saw him every week for the first 2 months or so. She had her first adjustment in May about 2 and 1/2 months after the accident. About a week later on the 3rd of June she fell off a 9 and 1/2 foot slide and landed on a concrete slab. She landed on top of her head and cracked her skull from her eye brow to her fontanel. Off to the hospital we went again and stayed for 3 days. As we left the hospital we went right to Dr. Blom's office and she was in need of an adjustment that was no surprise. He knew she needed to be adjusted because of her previous readings. So he adjusted her back in to place and rechecked her and sent us on our way. We have continued to see him for 5 months now and Rachel is doing great. From the amount of damage she has experienced we worried that there might be some side effects and she has none as far as we can tell. She is doing great. She will tell us about her fall off the slide and her stay in the hospital but her personaility is the same and she has no fears of slides or cars but does have a healthy respect for them now. I am so grateful for upper cervical care and the healing it has offered to my daughter. There are 3 things of note here from top to bottom of the X-Ray. 1. Please note 10 weeks after the injury the skull is still not healed and lined up correctly. 2. 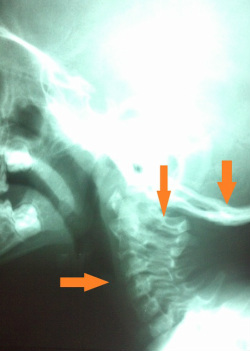 The ATLAS or top neck bone is so far out of position you can see through the posterior arch of ATLAS. 3. The cervical curve has reversed in the wrong direction. This is significant for many reasons most important is the excessive stretching this will place on the spinal cord over time. Many people that develop chronic pain syndromes and have strange unexplained problems have reverse cervical curves. 1. Please note the skull is NOW healed up and lined up correctly. 2. The ATLAS or top neck bone is NOW in its normal position. 3. The cervical curve is NOW in a normal forward arc. Dr. Grayson Blom is a Boise, Idaho native that works with a nationwide group of Doctors expertly trained and specializing in the Upper Cervical procedure. Dr. Blom is also one of the few Doctors in the state of Idaho trained and certified in the Upper Cervical procedure. We are dedicated to helping patients just like you who suffer from subluxation induced cervical curve loss and other spinal-related disorders.